For the last few decades, ITV have cornered the market when it comes to Agatha Christie. David Suchet's reign as Hercule Poirot is one of the channel's greatest achievements, adapting every single one of Christie's stories featuring the diminutive Belgian detective. Miss Marple hasn't always been so successful, with various actresses bringing the spinster sleuth (currently played by Julia McKenzie) to life. Now the BBC are getting in on the act, reviving lesser known husband and wife crime solving duo Tommy and Prudence ('Tuppence') Beresford. Unlike most Christie adaptations, their adventures aren't self-contained. Partners in Crime features two stories (The Secret Adversary and N or M?) each consisting of three episodes. In a set up typical of many a Christie mystery, a young lady vanishes from a train. 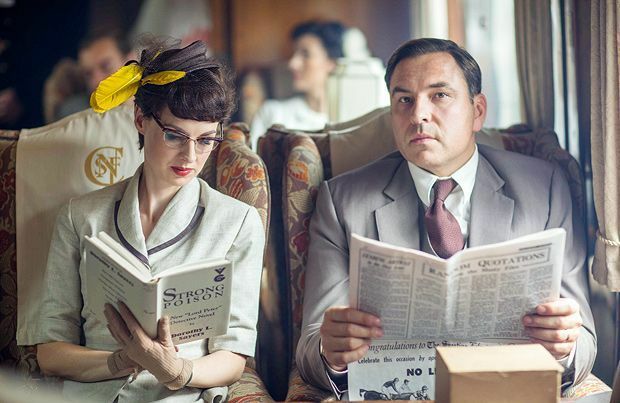 The disappearance of their travelling companion sparks the interest of Tuppence (Jessica Raine) and reluctant investigator Tommy (David Walliams) – aided and abetted by one-man retro-CSI division, Albert Pemberton (Matthew Steer) – who start following a breadcrumb trail of clues and soon find themselves neck deep in black market bookies, spies and other miscreants. Walliams and Raine are a perfect fit for this 50s crime caper. Tuppence is the dynamic driving force and brains of the operation. The best Christie adaptations capture the writer's wit (Suchet always played Poirot with a twinkle of humour) and Walliams brings a hint of comedy to the prim and prissy Tommy, who's far more competent than it first appears. Walliams has spent so long judging Britain's Got Talent, it's easy to forget he's a decent actor with impeccable comic timing. Partners in Crime doesn't break any new ground, but that's kind of the point. Taking us back to a world of quaint English villages, buttoned up suits and plucky derring-do, it's warm and comforting, and there's nothing like a gentle murder mystery for Sunday evening entertainment.